Before Christmas, I signed up to take part in a Secret Santa swap organised by the lovely Georgina and Laura. I was paired up with Tania from Bow Tied Beauty and after finding out a little about each other, set off to shop. It turned out that we both work in London, so we decided to meet up face to face to do our swap rather than post, which I was really excited about. We met the other day and had a great time nattering over a drink and unwrapping our goodies. 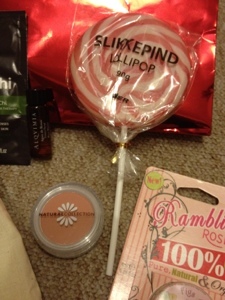 Both of us like natural products and so I was really pleased with the gifts that Tania bought for me. 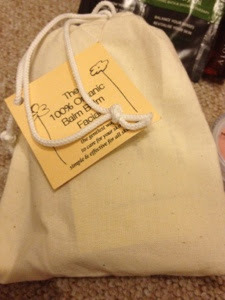 I received a Balm Balm facial kit which contains a mini cleanser, tonzer, serum, face mask and a muslin cloth. I'm excited to try this as I have read a lot about Balm Balm and their products sound perfect for me. 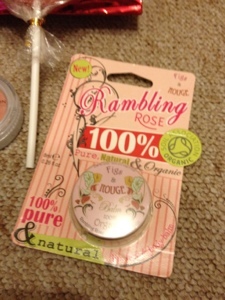 I also had a rose scented Figs and Rouge lip balm, which is my first foray into the brand. I've heard great things about them, so this is another soon to try product! There was also a Natural Collection blush that looks perfect for my pale skin, two sachets of Bodhi bath and shower gel and a little vial of Alqvinia rose water toner. Tania also popped in a very festive looking giant lolly which won't last very long in my house! I stupidly forgot to take pictures of what I bought for Tania, but you can view her post here. I really enjoyed doing this swap and it was great to meet another beauty blogger in person. Thank you to Georgina and Laura for organising and to Tania for being such a great swap partner! That blush is one of my favourites, is it in Rosey Glow? If it is literally goes with anything! Oh you got some amazing things! Great idea this was! Such a nice post! 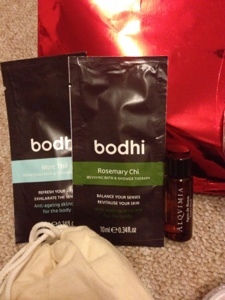 I haven't seen anyone else mention bodhi products on their blog before so this totally caught my eye - what do you think to them? I have a set of body wash miniatures which I'm working through at the moment!